Always looking for new chocolate, I picked this Côte d'Or up at my local fancy grocer for $3.99. It seemed like it was extremely thick, but this bar is actually two bars packaged together. The wrapper was covered in English stickers, so it seems like it comes straight from Belgium. 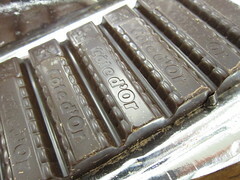 Côte d'Or is a Belgian chocolate brand that was acquired by Kraft Foods in 1990. I wonder if that sale was as controversial as the more recent Cadbury acquisition? For 56% chocolate, this bar had a beautiful satiny dark brown finish. The chocolate had an earthy scent, but rather than fruity, the flavor was more milky and almost sweet for a dark chocolate. Though a bit bitter, it was rich and almost savory, and the earthiness carried over into the finish. The melt was just a bit dry, but not chalky (and I definitely prefer a little dry to sticky). I prefer my dark chocolate to be darker, but this bar was pretty good. 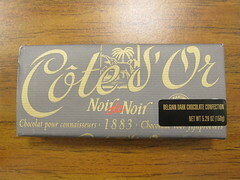 My husband loved this one, but I think I'll have to try the Côte d'Or 70% Noir Intense bar.